To me, the most perfect exhibit among the many wonders of Photo Kathmandu is the one that allows visitors to sit inside a camera; something that I had never done before. This is the camera obscura, created in a first floor room of the Yala Guest House, behind where the Char Narayan temple stood until earlier this year. Left open in the otherwise blacked-out window, a circular aperture, which looks about one inch across, creates an image on the bedroom walls of the palace square outside, upside down and laterally inverted. The figures walking on the ground below are most clearly seen on the ceiling at midday, when the sun is overhead, whereas the palace façade is silhouetted in the shadows made by its overhanging roofs. Later in the afternoon, when the sun picks up the west-facing walls, the details on them appear in low contrast, and the foreground is lost in the shade cast by the Yala Guest House. If there was a huge roll of film, or a ten thousand mega-pixel sensor loaded in the room, this phenomenon would be known as an exposure differential. In other words, it is a demonstration of the fact that you can have the right amount of light inside the camera to show the details in the bright parts, or in the dark parts of the scene, but not in both. Such cameras are far older than photography. A camera is literally a room or a chamber, and a camera obscura is a ‘dark room’. The physicist Ibn al-Haytham, who lived from 965 until 1040, described the camera obscura. More than ten years ago, the painter David Hockney rediscovered what seems to be the fact, that some artists of the European renaissance, perhaps as early as 1420, sat inside camera obscuras to trace the details of their subjects onto their medium, in that way achieving the realistic perspective in their work. In the process, it seems to Hockney, they also accurately reproduced the optical distortions their equipment represented to them. The first permanent modern photograph, made by projecting an image onto a light-sensitive material and then fixing it, was exposed in a room in France in 1826 or 1827, using a plate made light-sensitive by coating it in a particular type of naturally occurring bitumen (which is known as bitumen of Judea, or Syrian asphalt), to capture the view from the window. The bitumen-coated plate was then developed in a mixture of lavender oil and white petroleum (or white spirits, which is also used to clean paintbrushes). In a comparable way to how later photographic films and papers work, those areas of the bitumen upon which the most light had shone hardened in the developer, while that in the less exposed areas was washed away. Apparently, in the early twentieth century there was a camera obscura inside a room in the house of the famous Chitrakar family of photographers at Bhimsenthan in Kathmandu. Dirgha Man Chitrakar began making photographs in around 1908, using portable cameras with lenses, and sensitised glass plates in a process much closer to today’s film photography than to bitumen and lavender, and I have no idea what he used his camera obscura for. It must have been a showpiece, at least sometimes, more magical than the one in Patan now. Since last year I’ve been playing, intermittently, with pinhole photography. This works in the same way. It requires a light-tight container, such as a cardboard box, loaded with photographic film or paper. The boxes which iPhones come in work very well, because of the way the top slides tightly over the bottom, except that the resulting picture is the shape of an iPhone. Because the box is shallow but the photograph is broad, it creates a distorted perspective at the margins, like Hockney found in the old masters. The ‘lens’ (in fact there is no lens) is a tiny hole, made with a pin in a square of metalcut from a beer can, and stuck in the front of the box. It is important to make the hole very small (say 0.2mm), and perfectly round, because its size and shape will determine the quality of the image. I make several pinholes, examine them with a magnifying glass towards the light, and smooth them with the finest glass paper available in the shops that supply the statue-makers in Patan, then choose the best one. This doesn’t take very long. Some obsessives use a scanner to bring their pinholes onto a computer screen, then use Photoshop to measure them, but that’s crazy. A similar camera can be made with a pinhole in the body-cap of a DSLR. Like the image in the camera obscura, pinhole photographs are often low in contrast. With such a tiny aperture the whole scene will be ‘in focus’, but it will be somehow fuzzy, as compared to a photograph focused through glass. 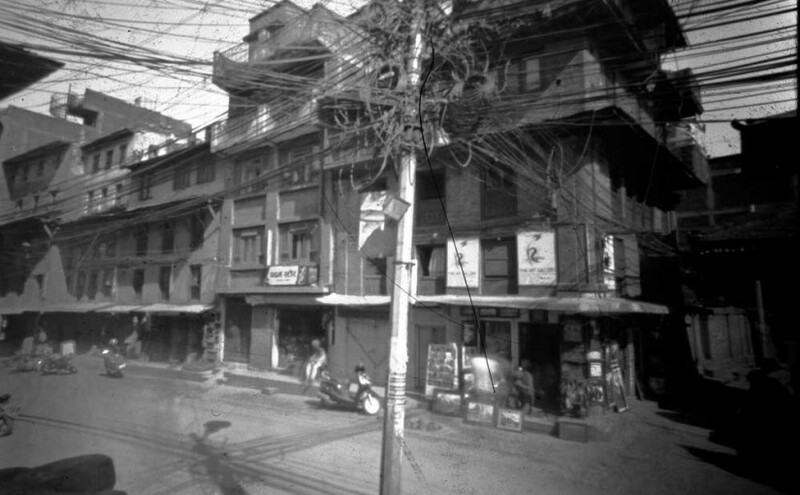 According to Ansel Adams (who had little use for such an arbitrary apparatus), this is because the image in fact consists not of the scene outside simply inverted through the pinhole into the camera, but of a huge number of tiny ‘image-circles’, corresponding to the pinhole, which seems like an analogue pixilation projected onto the medium inside. The exposure is controlled with the only variable left, which is the shutter of the DSLR, or by for how long the piece of black duct tape on the front of the box is lifted. A free app on an iPhone can guide this calculation.